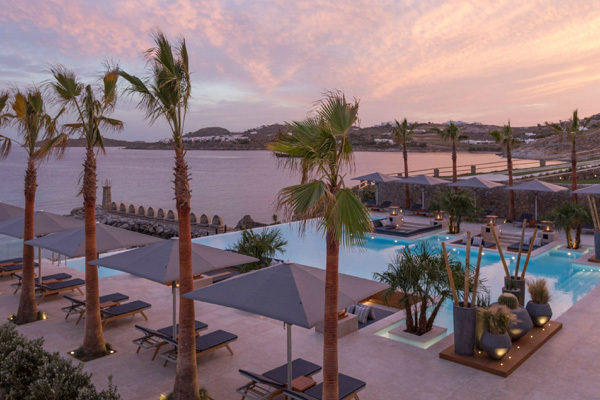 Santa Marina Resort & Villas, a leading resort on the Greek island of Mykonos, has completed a three-year, multi-million Euro refurbishment. Idyllically located on a secluded peninsula, just 3km from town, the privately-owned resort has unrivalled views across the blue sea of the Aegean. In addition, the resort - which comprises 100 rooms and suites and 14 beautifully designed villas - has the only private sandy beach on the island. The refurbishment has seen the total transformation of all rooms and suites – with seven now having private pools with lush gardens and the rest offering private sea view terraces. The interior style by Argentinian designer Silvina Macipe Krontiras is graceful and bespoke giving a feeling of warmth, luxury and tranquillity punctuated with beautiful art and finishing touches inspired by seaside resort living. The addition of a spectacularly designed, large infinity pool and Oasis lounge for adults only with stunning views of the bay gives the resort another dimension for those looking for a more relaxed vibe on the well-known party island. Furnished with comfortable sun loungers and an expansive sunken area with soft seating, it’s a great place to relax and sip a cocktail in the afternoon sun. The new area complements Santa Marina’s existing restaurant and bar, the Colonial Pool Restaurant and Bar which serves all day Mediterranean cuisine. The second pool is ideal for families and has a nearby children’s Lappset playground. The resort is also the location of the world’s first Buddha Beach Bar. Offering exceptional Mediterranean and Greek fusion cuisine, as well as celebrated signature Buddha Bar specialities and cocktails, the scene constantly evolves throughout the day and night. During the season, there is a mix of famous chefs, mixologists and DJ’s, not just for hotel residents to enjoy but also guests from visiting yachts. The new Ginkgo spa combines a beautiful and serene aesthetic with flowing water surrounding it to create a feeling of tranquillity. There are five large treatment rooms for expert therapists to deliver soul enriching and body pampering treatments with ESPA and Phytomer products, including a couple’s massage signature treatment. The new hammam is a major highlight of the spa with its stylish mosaic tiled décor and specialist exfoliation and ancient cleansing rituals utilise heat for therapeutic purposes. The relaxation area, encircled by shallow waters, long flowing curtains and plush beds, provides a quiet pre and post-treatment sanctuary. Located within the spa is the new gym, which overlooks the infinity pool and comprises state of the art TechnoGym equipment. A major addition over the last three years to the hotel’s accommodation offering are 14 villas with pools, including three new villas as part of the extensive refurbishment. Ruby, Lapis Lazuli and Sapphire, all with private pools, have been beautifully decorated in a similar bespoke style as the new rooms with an elegant and relaxing decor. The resort’s finest villa in terms of design, location and size is Villa Horizon (six Bedrooms) – the ideal place for a large families or group of friends.